What the heck is KRILL anyway? Krill or Euphausid Shrimp are vital forage species that are at the very foundation of life in the ocean. Fish, birds, seals, whales and even humans depend on them. Life in our oceans forms a complex food web that depends on the sun providing energy for photosynthesis by tiny plants called phytoplankton which serve as food for tiny little sea animals called zooplankton. These provide food for larger species ... one of which is the wildly prolific and abundant Krill that is vital to larger fish, birds, seals, whales and ultimately man. There is a story behind this illustration. The Bay of Fundy and Northern Gulf of Maine are well-known for their biodiversity and richness. During 30 years of work in marine biology in this area, we observed many awesome events ... strange underwater creatures, seals, whales, the nearly extinct North Atlantic Right Whale, and the huge masses of krill being fed upon by the creatures of the Bay. I distinctly remember a particular day. We were in Head Harbour Passage off Campobello Island and stopped at one large mass of krill that turned the surface red and was being actively fed on by gulls and other seabirds. The water was particularly clear that day and the krill windrowed up against the side of our boat. As we looked down we could see hundreds of herring blasting their way up into the krill in a feeding frenzy and below them large mackerel that were feeding on both the krill and the herring. Below that were the shadows of larger fish that darted up into the mass. These were likely cod and pollack that are common in the Passage. But then it happened ... the event that created the memory. A truly huge shadow appeared and moved rapidly through the mass of krill, herring and mackerel. This was a truly large fish ... and we were unable to identify it. What was it? A tuna? A shark? Or something else? We will never know what the huge creature was, but it completed the mental picture I needed to draw the food web illustration in this article which has been used over and over in numerous articles and publications. Large-scale fishing for krill developed in the late 1960s and early 1970s, and now occurs only in Antarctic waters and in the seas around Japan. In 1993, two events caused a decline in krill fishing: Russia exited the industry; and the Convention for the Conservation of Antarctic Marine Living Resources (CCAMLR) defined maximum catch quotas for a sustainable exploitation of Antarctic krill. After an October 2011 review, the Commission decided not to change the quota and it apparently remains the same today. The annual Antarctic catch stabilized at around 100,000 tonnes, which is roughly one fiftieth of the CCAMLR catch quota. The main limiting factor was probably high costs along with political and legal issues. 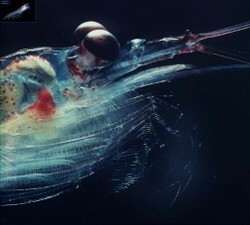 The krill fishery in Japanese waters primarily targets the North Pacific krill (Euphausia pacifica), which reaches a size of about 2 centimetres (0.79 in). The annual catch is of the order of 60–70,000 tonnes. Minor fisheries for Euphausia nana (a few thousand tonnes) and Thysannoessa inermis (a few hundred tonnes annually) also exist. The fishing ground are all above the continental shelf close to the coast and at most 200 m (660 ft) deep. E. nana reaches only 1.2 cm, and T. inermis can grow to 3 cm (1.2 in). E. pacifica was fished as early as the 19th century. Fishing is done with small boats. The traditional technique uses bow-mounted trawls, augmented by fish pumps since the 1980s. A bow-mounted trawl can exploit only surface swarms of krill up to a depth of about eight metres. In the 1970s, the krill fishery expanded drastically and began to use also one- or two-boat seines, which can catch swarms as deep as 150 m (490 ft). A peak in the krill production was reached in 1992 with over 100,000 tonnes. The following year, catch regulations were enforced, and since then the annual catch has been reduced by about 30%. As of 2003 experimental small-scale harvesting was being carried out in other areas. For example, fishing for Euphausia pacifica off British Columbia and harvesting Meganyctiphanes norvegica, Thysanoessa raschii and Thysanoessa inermis in the Gulf of St. Lawrence. These experimental operations produce only a few hundred tonnes of krill per year, indicating that any large-scale harvesting operations in these areas are unlikely due to opposition from local fishing industries and conservation groups. Pressure for resumption of fisheries continues. Art's Place Library Files for "krill"
My library contains thousands of references, original images and articles, public domain resources and current references. 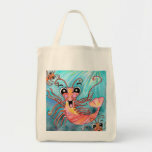 Check out the "Krill Files" at Art's Place. The singularity is the merging of human being and technology into one symbiotic piece, prepare for the next "What The Bleep" or "The Secret" Movie Concept!